The Thunderbirds began in 1937, when the Phoenix Chamber of Commerce expanded its role as a convention and tourism bureau. There was a need for a special events committee to venture into new fields. Five young executives were selected to lead the committee. The Phoenix Chamber of Commerce suggested that the committee become an “official” group and expand its membership. Each of the five then selected ten additional members to make up a committee of 55. The Thunderbird name was chosen because the emblem of the Phoenix Chamber of Commerce was, and still is, a Thunderbird derived from American Indian symbols. One of the early inductees was Bob Goldwater, an avid golfer. Goldwater thought it would be a great idea to sponsor a golf tournament. That first year, Goldwater sold the tickets, recruited volunteers and set up the golf course at the Phoenix Country Club. The Phoenix Open caught on, and in 79 years, has developed into one of the leading stops on the PGA TOUR. 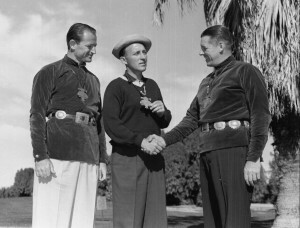 Goldwater was Tournament Chairman from 1934 through 1951 and is affectionately called the “Father of The Phoenix Open.” Active Thunderbird membership is limited to 55 members. Each has demonstrated a sincere interest in sports and a dedication to community affairs. All Thunderbird activities and events are the prime responsibility of these Active Thunderbirds and are under the watchful eye of the Big Chief and Thunderbird Council. When a Thunderbird reaches the age of 45, their status changes from Active to that of Life Member. Although they are relieved of continuous duties, it is not unusual to see a Life Thunderbird lending a helping hand at The Waste Management Phoenix Open or one of the many other Thunderbird-sponsored events. To date, there are over 300 members comprising The Thunderbirds organization. How do I become a Thunderbird? To become an active Thunderbird you must be nominated by at least two “Active Thunderbirds.” Nominated persons are then voted upon by the 55 “Active” members. If I’m not a Thunderbird, how do I volunteer at The Waste Management Phoenix Open? Each and every year, the Waste Management Phoenix Open relies on thousands of volunteers and an abundance of community support to host a successful event. If you’d like to volunteer for the 2019 Waste Management Phoenix Open, please check back this fall to register as a volunteer. The Thunderbirds have elected Chance Cozby as Big Chief (president) of their organization for the 2019-2020 fiscal year. John Bridger is the Executive Director of the organization. Bridger is responsible for the general management of the Waste Management Phoenix Open as well as directing the day-to-day operations for the Thunderbirds. Bridger is an Arkansas native and was raised in Wellton, Arizona. He is a graduate of Northern Arizona University and later went on to receive accreditation’s from Northwestern University and The University of Virginia. Prior to coming to The Thunderbirds, Bridger served as executive vice president for Bank of America in Dallas, Texas, and was directly responsible for more than 425 bank centers and 4,800 banking associates. The Thunderbird roster and directory are not published for public viewing. How can I stay up to date on Thunderbirds Charities news? You can check out our website by visiting thunderbirdscharities.org or view our Thunderbird Charities Annual Newsletter here! Longevity has often been called the hallmark of success. The silver pendant of The Thunderbirds is emblematic of continuous civic pride and unrivaled success in the promotion of the Phoenix area. The Thunderbirds and the Waste Management Phoenix Open are currently celebrating their 82nd Anniversary. Through the years, these extraordinary citizens have provided so much for so many. The spirit created has provided a lasting legacy for us all. Synonymous with The Thunderbirds is the Waste Management Phoenix Open, possibly the finest sporting event in Arizona. Every January, the Waste Management Phoenix Open attracts the largest sporting event crowds in the world and is recognized as one of the finest golf events on the PGA TOUR. At the 2017 Waste Management Phoenix Open, more than 655,000 fans made their way to the TPC Scottsdale, breaking the previous weekly record of 618,365 that was set in 2016. All told four attendance records were broken in 2017 — the weekly attendance mark, plus record crowds on Wednesday (77,906), Friday (169,004) and Saturday (204,906). In recent years, PGA TOUR players voted the Waste Management Phoenix Open as their favorite stop of the PGA TOUR. While The Thunderbirds’ association with professional athletes garners the most recognition and publicity, it is their work with the community that brings them the most satisfaction. Millions of dollars of Phoenix Open proceeds have been spent to benefit numerous organizations and individuals, most notably, the courageous athletes of the Special Olympics, youngsters of the Boys and Girls Clubs of Scottsdale, Phoenix and East Valley and the affiliated agencies of the Valley of the Sun United Way. As the premier sponsor of the Special Olympics Summer Games, The Thunderbirds are providing an outlet of athletic expression for these challenged competitors. Nowhere will you witness the absolute joy and enthusiasm of a runner as he or she crosses the finish line, not in first place, but in the arms of his or her greeter. This unbridled passion for competition speaks volumes of The Thunderbirds’ commitment to these determined individuals. From caring for the underprivileged to helping those striving to make the United States Olympic teams, The Thunderbirds are doing all they can to make a difference for those who call Phoenix their home. The Thunderbirds began in 1937, when the Phoenix Chamber of Commerce expanded its role as a convention and tourism bureau. There was a need for a special events committee to venture into new fields. Five young executives were selected to lead the committee. The Phoenix Chamber of Commerce suggested that the committee become an “official” group and expand its membership. Each of the five then selected ten additional members to make up a committee of 55. The Thunderbird name was chosen because the emblem of the Phoenix Chamber of Commerce was, and still is, a Thunderbird derived from American Indian symbols. One of the early inductees was Bob Goldwater, an avid golfer. 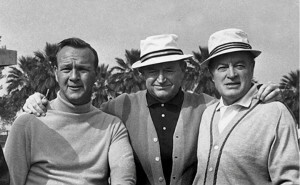 Goldwater thought it would be a great idea to sponsor a golf tournament. That first year, Goldwater sold the tickets, recruited volunteers and set up the golf course at the Phoenix Country Club. The Phoenix Open caught on, and in 70 years, has developed into one of the leading stops on the PGA TOUR. Goldwater was Tournament Chairman from 1934 through 1951 and is affectionately called the “Father of The Phoenix Open.” Active Thunderbird membership is limited to 55 members. Each has demonstrated a sincere interest in sports and a dedication to community affairs. All Thunderbird activities and events are the prime responsibility of these Active Thunderbirds and are under the watchful eye of the Big Chief and Thunderbird Council. When a Thunderbird reaches the age of 45, their status changes from Active to that of Life Member. Although they are relieved of continuous duties, it is not unusual to see a Life Thunderbird lending a helping hand at The Waste Management Phoenix Open or one of the many other Thunderbird-sponsored events. To date, there are over 300 members comprising The Thunderbirds organization. Thunderbirds wear large silver pendants suspended on leather thongs, and each year a Bead Committee awards silver beads to those members who have performed their respective duties with quality and efficiency. Thunderbird-sponsored athletes participate in the entire spectrum of sports; but it is in golf that The Thunderbirds have had the most impact. Each year, The Thunderbirds sponsor The Thunderbird Collegiate Invitational. Now in its 34th year, this tournament is considered by many as the “Waste Management Phoenix Open of Collegiate Golf.” It is a proven springboard into the PGA TOUR. Players like Bobby Clampett, Corey Pavin, Dan Forsman, Howard Twitty, Jim Carter, Notah Begay, Phil Mickelson, Steve Jones, Tiger Woods, Tom Purtzer and a host of others have participated in this illustrious event. Proceeds from the tournament benefit the men’s and women¹s golf programs at Arizona State University. Every summer, The Thunderbirds sponsor the Thunderbird Junior and Senior Golf Classics, which form the nucleus of one of the most extensive junior golf programs in the United States. These tournaments have showcased the talents of current PGA TOUR and LPGA stars like Billy Mayfair and Danielle Ammaccapane. In 1999, The Thunderbirds, in conjunction with the American Junior Golf Association, held the inaugural Thunderbird International Junior at Grayhawk Golf Club. The first event of its kind in junior golf brought together a world-class field of Polo Golf All-Americans and U.S. and International champions of junior golf from throughout the world. This event will annually feature future champions of the golfing world. The Thunderbirds and The Waste Management Phoenix Open form a winning combination whose success is matched only by its longevity.